Tom is back with a few players going head to head in fantasy for one last time this season. North Melbourne skipper Andrew Swallow is your typical inside midfielder. A clearance expert and tackling machine, Swallow was the captain of Western Australia’s under-18 team and received All-Australian honours. Now 29 years-old, Swallow started the 2016 season slowly, collecting just 8 disposals in the first half before eventually ending with 84 Fantasy points. Despite not starring, Swallow gave it his all against Brisbane and ended with 74 points. Back-to-back 11 tackle games against Melbourne and Fremantle somewhat saved his scores as he failed to find much of the footy. Although it wasn’t his highest Fantasy score of the year to this point, Swallow dominated the stoppages against Gold Coast despite his tackle numbers being considerably down on recent performances. After five scores in the 60s, 70s and 80s, Swallow finally cracked the ton in the Kangaroos sixth win of the season over the Western Bulldogs. He managed 23 disposals, 1 mark, 14 tackles and 107 points. The skippers price had now reached $432,000 ahead of round seven. In just 72% of time on ground, Swallow scored 91 Fantasy points as a result of yet another double-figure tackle count. Against Essendon, Swallow managed 11 contested possessions, six inside-50s and three clearances along with 27 touches and 100 Fantasy points. Andrew was disappointing against Carlton and failed to make much of an impact on the game having just 2 kicks. Swallow once again produced a high clearance and tackle showing, this time against Sydney, which resulted in his third ton in five matches. His game opposed to Richmond yielded 111 Fantasy points and further proved that his inside game is one of the best in the league when on-song. He suffered concussion early on in the game against Geelong which kept him out for a week. In the next two clashes against Adelaide and West Coast, Swallow tackled hard and worked tirelessly in a defeated midfield. In round 17 against Port Adelaide, Swallow went head-to-head with his opposite number Travis Boak and lost out in a tight clash. Swallow scored only 49 Fantasy points against Collingwood but was still good in and under. In the past two weeks, Swallow has been excellent. He scored 127 Fantasy points in both matches and racked up a total of 21 tackles between the two games. At a dirt cheap price, Swallow’s new found form and constant tackling could see him be the wildcard which wins you your league final as he’ll likely be a unique. Andrew Gaff is one of those players who always seems to sneak under the radar on the Fantasy scene. Last year he was excellent and played a big role in the Eagles road to the Grand Final. He hit the ton fifteen times in his 22 games and was particularly influential from rounds 8-17 where his lowest score was 100. Gaff was recruited from the Oakleigh Chargers in Melbourne and made his way west with pick four in 2010. After averaging 65 in his debut season, Gaff improved in 2012 to record an average of 86 Fantasy points. Unlike many stars of the game, Gaff’s third year was slightly disappointing but the signs for the future were as clear as day. Since then, the Victorian has risen to a new level and last year averaged over 100 points for the first time in his career. He also polled 17 Brownlow votes, led the Eagles for disposals, kicks and inside 50’s and was their best player in an otherwise lacklustre Grand Final performance. And this year was shaping to be just as good after he managed four 100’s in the first five games. During this period his trademark gut-running allowed him to float back into defence to earn a cheap +6. Gaff is the typical outside midfielder who spends a lot of time on the wing. In many ways he’s the release player, the one they look for to propel the ball into the forward 50. His marking and kicking have always been there, but tackling has never been a strong point. Normally the scores of players who don’t lay tackles are affected, however Gaff makes up for this through sheer ball accumulating. Going into round nine, Gaff was averaging 99.6 points thanks to a couple of 111 point games. But his season quite literally took a hit when Power defender Tom Jonas launched an elbow into the scone of the wingman. Tom Jonas copped a hefty six week suspension for the incident that resulted in Gaff missing the clubs next match. Thankfully he made a speedy recovery and is back out there playing. Although in the three games after, Gaff has struggled to get back into full throttle. He scored just 79 Fantasy points against the Bulldogs and didn’t pose any sought of threat. Although he won just 22 disposals and finished with 66 Fantasy points, Gaff was more damaging against Adelaide. Thankfully, a 35 possession game against Essendon got things back on track. Gaff’s form has fluctuated since the Bombers match. He managed solid hundreds against Carlton, Collingwood and Hawthorn but was disappointing in the derby. Adelaide away is no easy task but hopefully he can come home with a bang. Verdict: Both Andrew Swallow and Andrew Gaff have had to navigate their way through so patchy form. After Gaff was hit by Jonas his form, at least for the next month, was not near the heights of last year. Swallow was also a culprit to concussion and was forced to miss a week. The pair’s form has picked up in the past weeks though, with both players managing solid hundreds. I would go for Gaff as the safer option but Swallow is very cheap for the scores he has been producing of late. Lachie Hunter has emerged out of a young pack of Bulldogs to become one of the games best outside midfielders and Fantasy scorers. Last year, although he was in and out of the side, Hunter showed promising signs and has certainly delivered this year. Fellow Bulldogs midfielder Tom Liberatore was included in the vast majority of early pre-season teams but as the season proper drew closer, the Hunter bandwagon continued to gain momentum. His ownership rose 4% after an opening round score of 108. Hunter found loads of space against Fremantle and amassed 31 disposals and 10 marks. It was a similar performance against St.Kilda where he once again found space on the outside, leading to 35 possessions and 130 Fantasy points. Although he didn’t find as much of the ball against Hawthorn, Hunter still offered plenty of run and carry off the wings. He backed it up with 115 points against Carlton and was easily one of the best players on the ground. His four inside-50’s and six clearances could see him poll some Brownlow votes. Lachie further improved his reputation against Brisbane where he pushed up into the forward line and looked threatening. In round 6, for the first time in his short career, Hunter was tagged. Ben Jacobs spent almost all of the game on Hunter but, in a true test of character, he was still able to significantly influence the game with 44 disposals, 6 marks and 133 Fantasy points. He did struggle in the second half against Adelaide after having 20 touches in the first half. The father-son selection finished with 73 Fantasy points. Hunter’s work-rate in the match with Melbourne really stood out. He played 86% TOG and ran tirelessly for the majority of the game. His kicking, ability to find space, endurance and productivity were now clearly his greatest strengths. In round 11, many Fantasy coaches were thrilled with the efforts of the popular Tom Rockliff who stole all of the glory from the round. However Hunter was also brilliant, collecting 38 disposals, 11 marks, 6 tackles, 1 goal and 163 Fantasy points. He didn ton up in the next two rounds but scored 133 against the Swans. The rest of the season panned out well for Hunter with three hundreds and two nineties in the past seven matches. There’s no doubt Lachie Hunter has a big future for the Bulldogs and for Fantasy fans. He has been sensational and at 21 years-old, could he be the next pig? There was an article published on AFL.com.au which questioned who was the better pick up, Dangerfield or Treloar. Now, since this article was released Patty has gone on a point spree, rewarding his owners with massive scores. In my eyes, Dangerfield is one of the best pick ups in AFL history but for Treloar to feature in a comparison with Danger shows how good his 2016 season has been. Treloar is similar to captain Scott Pendlebury in the way he uses the footy and his cleanness in congested spaces. 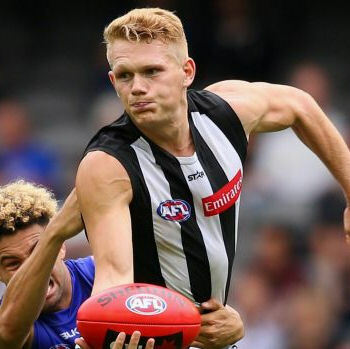 After being picked up by the Giants as a 17 year-old zone selection, Treloar wasted no time, averaging 82 and 88 in his opening two seasons at the new club. But, as is the case with many younger players, Treloar wished to return ‘home’ to his native Victoria. An infamous war broke out between Richmond and Collingwood, but it was the black and white outfit who signed up one of the best young talents. After 22 rounds of footy, the Treloar deal has paid dividends. The season started well for the ‘Pies with a win over Richmond but a successful debut for Treloar was just as important. He collected 34 disposals, 3 marks, 4 tackles, 1 goal, 117 Fantasy points and looked typically clean with ball in hand. Treloar was just as prolific the following week but missed a few targets with his 8 inside-50s. Although Adam is more of a balanced midfielder, it was his contested ball winning which really stood out against St.Kilda. He managed a slightly disappointing 85 points but followed it up with a big game against Melbourne a week later. A superb second half was the main factor behind his 32 possession showing in round 5 which led to a then season high score of 129 points. Again it was Treloar’s inside game which stole the limelight against West Coast. Carlton and in-particular Ed Curnow managed to quell his influence in the clash between two fierce rivals. Although he still scored 96 points and found 27 touches, his defence wasn’t as good as it should have been. As stars do, he managed to bounce back in round 8 and carved up the Lions with 3 goals. Treloar went on to feature prominently in the next three games, toning up in each and providing great drive out of the midfield. It was once again Carlton who put the clamps on him in round 15, prompting the Giants to also apply a heavy tag. Adam is currently on a streak of four consecutive hundreds and is the fifth highest point scorer of the year. Treloar is still young and is already a Fantasy star. The move to Collingwood has been a shinning light in an otherwise underwhelming year for Australia’s biggest sporting team. A high production midfielder who has all the attributes. Verdict: Whilst the Swallow/Gaff comparison was between two players with very contrasting roles, this one features two who play a similar style. Adam Treloar spends more time on the inside than Lachie Hunter but both have silky skills with ball in hand. Not only that, but they find plenty of the pill. There ability to run and carry with the ball is exceptional. Treloar and Hunter have performed above expectations this year and have announced themselves as Fantasy premiums. If I had to choose one, I’d go with Hunter as he has the better fixture. opponent has monty… do i cancel him out or try and beat? or do i stick with D.Wells as F6 and go for Dangerfield as M8 instead of Hunter as M8? Neale v Parker v JPK??? For my grand final… Parker and Naismith or Jacobs and B.Crouch?